New Early Computer Music Discovered; What Was the First Digital Synth? Australia’s CSIRAC made the first computer-generated melody, but no recordings remain. For other primitive early computer music, catch new strains from the BBC from 1951. Photo by thefunklab. As several of you noticed, the BBC has discovered 1951 recordings of computer-synthesized music, predating the previous earliest recordings from New Jersey’s Bell Labs in 1957. So, who gets the credit for the first digital synthesis? This particular recording doesn’t change much, in that Bell was never recognized as the first computer-created music – they just happened to have the earliest recordings still available. Australia’s CSIRAC computer is generally recognized as the first computer to play a musical melody. Bonus points: the CSIR Mk1 played music in August 1951, before just about anything else, and it did perform in real-time. But it doesn’t count as the first digital synth, because it just sent raw pulses of data directly to the speaker. (Digital-to-analog converters didn’t actually exist in practice at that point.) And since no one seems to have recordings of the CSIR Mk1 from August, the UK Ferranti Mark 1 recording for BBC wins in the documentation category. CDM loves Australia, so perhaps we can simply say that Australia gets the credit for the first computer-programmed musical materials, just not digital synthesis as they lacked a DAC. This Ferranti box made some of the first musical noises by a computer. From an electronic pr0n-filled page of vintage UK ads, via the wonderful Mike’s Electric Stuff. The BBC recorded the recording above several weeks too late to beat Australia, but the computer in question is the heir to a very important machine. Baby (Small Scale Experimental Machine) is credited as the first “universal” computer – that is, it had the marked advantage of functioning with a range of custom software rather than needing to be rewired each time you wanted to change tasks. Baby predated Australia’s CSIRAC by about a year. The recording here is of the Ferranti Mark 1, which is a production-ready descendent of the Baby. The recording itself is very interesting, because like the CSIR Mk1, the software used allowed for basic custom programming of melodies. Likewise, while the primitive music was little more than a novelty, it did illustrate to the public that computers would have broader applications than most had initially imagined. Like CSIR Mk1, though, this isn’t really “computer music” as we now understand it – though it did involve basic sequencing. 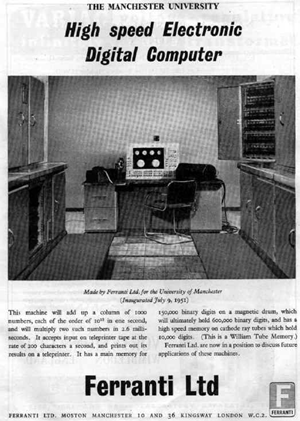 The key moment is 1957’s recording of a 17-second composition by Mathews on an IBM 704. (That also means that Music N and Mathews handily win the first original computer music prize.) Max tells some great stories about that train ride over to Manhattan from New Jersey to feed the 704 music. The 704 wasn’t yet speedy enough to handle real-time sound generation, either – let alone counting the train commute time. And while these particular examples from Australia and Manchester aren’t entirely musical, I think it’s equally fascinating that the chiptune, circuit bending, and DIY electronics scenes are all returning to the fundamentals of digital synthesis. To these younger musicians, it seems to be a way to get more intimate with the organic qualities of the technology. Thanks to all of you who sent this in!